Globe Launches RUN FOR HOME: The Globe-Ayala Land City Run for Habitat for Humanity - Bongga Ba?! Globe opens the registration for its first ever running event that is seen to attract runners and health enthusiasts alike, as it features use of th disposable electronic timing chips to track running time during this fit and fun activity. The RUN FOR HOME: Globe-Ayala Land City Run for Habitat for Humanity is slated ion July 19, 2009, Sunday at 5 AM at the Bonifacio Global City. It offers 3-kilometer, 5-kilometer, 10-kilometer and 21-kilometer runs that will make use of the new Bonifacio Global City to Makati Central Business District route. This run will support Habitat for Humanity to benefit the KapitBisig Para sa Ilog Pasig Project. Assembly time for the 3-kilometer run is at 5:35 AM and gun start at 6 AM. 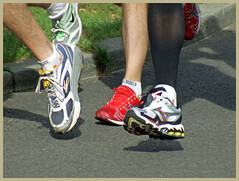 For the 5-kilometer run, participants must assemble at 5:25 AM in the time for the 5:55 AM gun start. The 10-kilometer run’s assembly is at 5:15 AM as the gun starts at 5:45 AM. Runners joining the 21-kilometer run must assemble by 4:30 AM for the gun start at exactly 5:00 AM. Globe brings the disposable electronic timing chips to the Philippines to track the running time of participants to the RUN FOR HOME – a first for the running event in the country. The disposable electronic timing chips are miniature transponders in a specially designed plastic housing. These are used in popular international marathons where the chip is attached to a runner’s shoelace and in triathlons where is placed as an ankle bracelet. Registration is from June 19 to July 3, 2009 only, through the Globe website or participating Globe Business Centers and Fitness First branches in Metro Manila. To join RUN FOR HOME, new Globe Prepaid subscribers can purchase a Globe Prepaid Sim for 45, load P300 worth of credits and register to Unlitxt All Day for P80. Existing Globe Prepaid subscribers can load P300 worth of credits and register to Unlitxt All Day for P80. Globe Postpaid subscribers and Globe Platinum members need to pay P300 as registration fee and register to Unlitxt All Day for P80 to join the run. Otherwise, anyone can opt to register to 3-kilometer, 5-kilometer, 10-kilometer, run by paying P500 and P700 for the 21-kilometer run. Fom July 16 to July 18, 2009, exactly 3 days before the RUN FOR HOME, registered participants can pick up their race kits which include the official race number, safety pins, route maps singlet and the disposable electronic timing chip, at the Bonifacio High Street (in front of ROX). Log on to www.globe.com.ph/runforhome or visit participating Globe Business Centers and Fitness First branches in Metro Manila for more information regarding RUN FOR HOME. join na rina! dali! have you mention it to rory? i will be joining this event. actually just heard it from my manager na extended pla ang registration. we registered on this site. http://www.globe.com.ph/runforhome. we’ll be up for the 21k nga pla. sino b sa inyo tatakbo sa event na ito?